NYCHS webmaster Tom McCarthy stresses a point about his research paper related to Rikers USCTs. 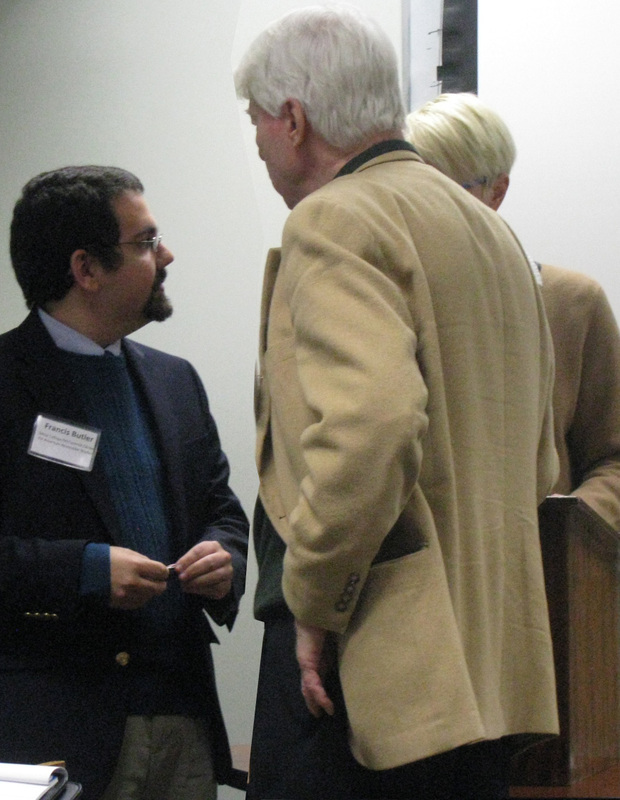 SUNY Albany electronics technician, left, confers with presenter and commenter. 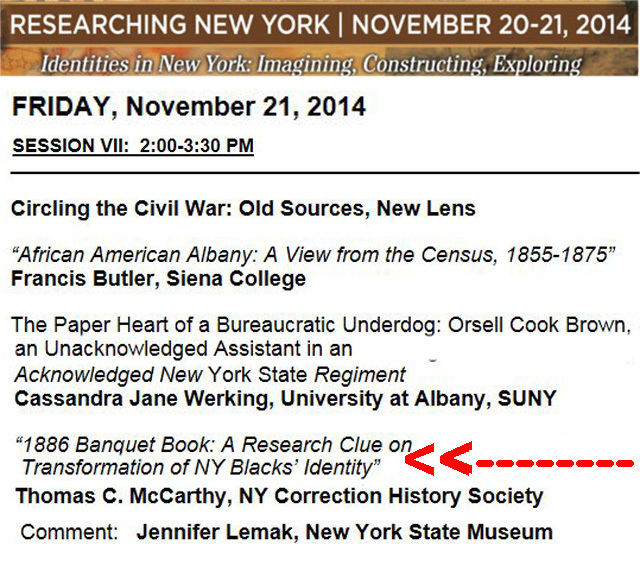 On Friday, Nov. 21, at the Researching New York 2014 Conference in the SUNY Albany Science Library, a research paper entitled 1886 Banquet Book: A Research Clue on Transformation of NY Blacks’ Identity -- augmented by PowerPoint slide projections -- was presented. It detailed how the Union League Club of New York's banquet souvenir book can serve as an excellent resource for studying the start-up of Rikers Island's United States Colored Troops regiments and how such military service during the Civil War helped transform African-Anerican identity. The presenter, who is webmaster of this CorrectionHistory.Org site and admin of its 1,230+-member New York Correction History group on Facebook, has prepared different digital format versions of the presentation. Links to access them are listed below. You can view any or all the versions on your screen or download them for later viewing and/or printing. PPT -- "1886 Banquet Book: A Research Clue on Transformation Of NY Blacks’ Identity," the 11-slide series of PowerPoint projections. No slide notes. 1.8 Mb read-only file. DOC -- "1886 Banquet Book: A Research Clue on Transformation Of NY Blacks’ Identity," Microsoft Word document, complete text, including footnotes and source cites. No images. 1997-2003 Word version. 61 Kb. PDF -- "1886 Banquet Book: A Research Clue on Transformation Of NY Blacks’ Identity," an Adobe PDF version of the 11-slide PowerPoint series plus the slide note texts. One of two regimental flags presentation images cited in Slide 5 text does not appear in the PDF version but does appear on this web page immediately below. 1 Mb. 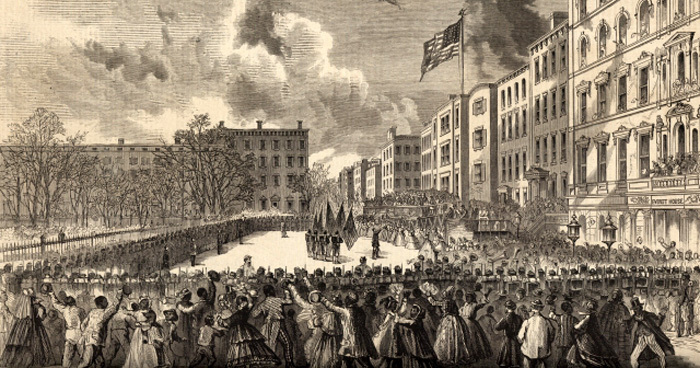 Sketch in Frank Leslie's Illustrated Newspaper of March 26, 1864 depicts presentation of regimental flags to Rikers' 20th United States Colored Troops (USCT) March 5 in front of Union League hq, Union Square. 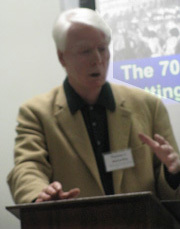 The entry in the Researching NYS History 2014 conference for the Friday, November 21, afternoon panel session at which the NY Correction History-related paper was presented. Emphasis added. The photos of Union League banquet book presentation at SUNY Albany were taken by David Minor of Eagles Byte Historical Research. The entry in the Researching NYS History 2014 conference for the Friday, November 21, afternoon panel session, at which the NY Correction History-related paper was presented, had been based, in part, on this web site's 2014 Black History Month presentation, the icon for which appears above. Click to access. Rikers Island's 26th U.S. Colored Troops on parade.